Ok here's a different potential swap. I have acquired an '88 F-350 dually gasser… 460/C-6/4.10's. I'm going to run this truck as -is for the rest of this year… I have a few routine maintenance things to deal with… tires, brakes, etc. But I've thought about doing a 6BT swap at some point in the future. This truck is not a daily driver… it's regular use will be hauling a race car trailer, wood pellets and general HD work. 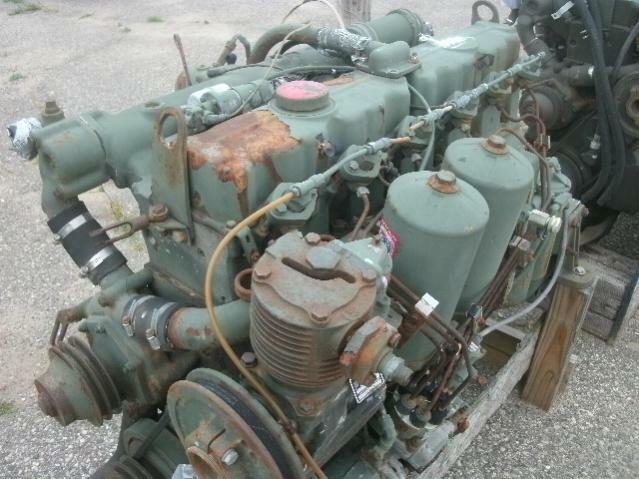 So today, out of the blue, I found a great deal on two rebuilt military Hercules LDT-465 six cylinder turbocharged engines. 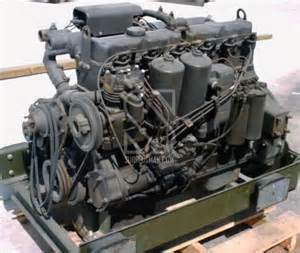 These engines weigh a bit more than a Cummins 6BT (1400#) but that's fully dressed with a big 24v starter, air compressor, two large oil filters and fuel filters, bellhousing, clutch, flywheel, etc. I was told the stripped weight is closer to 1050 to 1100# but I really don't know at this point. A Cummins seems to be closer to 950#. The physical size of the Hercules is similar… 42" long (less bellhousing)… 41" high (bottom of oil pan to top of valve cover) and about the same width. They use an SAE bellhousing. 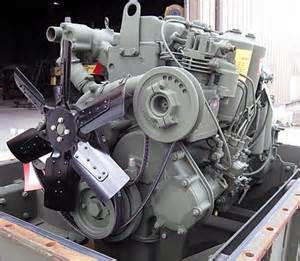 These are Deuce and a half multi-fuel engines… durable work horses. They are rated @ 140HP @ 2600 RPM's… 325 Ft. Lbs of TQ. 478 cubic inches. There is a near identical engine with revised fuel and timing curves (so I'm told) that's 180HP and 525 TQ… these may be able to be uprated. They are fresh military rebuilds… done in the 80's and still in the crate. I can buy both engine for less than a used 6BT with 200,000 miles. My question… should I pull the trigger? I can fab anything I need to make 'em work. I have access to two very good machinists… the rest I can do in my shop. Take a peek at the generic pix I've posted. I ain't skeered… would YOU be? Last edited by Herk; 07-05-2014 at 05:21 PM. Last I measured, the 6BT is 36" front to back. At 42", you're in the same league with the 8.3 cummins, DT466, and 7.8L Ford Brazillian. I've often thought about stretching the nose of a pickup to better fit one of these engines. Shouldn't be too bad really if you had some spare fenders and a hood to mess with. Probably only need 6-8" off the aft ends anyways. Do your homework though. I great deal on an engine or two can easily be burnt up trying to get matching parts and/or making it fit. I haven't put a tape measure to a 6BT… I found a site on-line that gave a 40" length IIRC. The Hercules is 42" from fan hub to rear block surface where the bellhousing bolts on. I would imagine a 4" body lift may be needed which would help it slide into place. I've seen DT360 and Perkins installations in pre-'97 F-series. They are close in size. When I spotted these engines I took out my tape measure and they sure seem to be about right. Today I may take another ride with a friend and snap more pix and measure some more. I'd have to figure a way to get some vacuum to run the power brakes… the engines mount off of the front of the engine using a cradle but I think there are some threaded bosses on the sides, too. Of course the bell has provisions for side mounts if i needed to use them. These are front sumps which would work well but a little fabricating may be in order. I need to bone-up on ID-ing SAE bellhousing's… I don't know how to differentiate between models… can anyone help with that? Overall I think this could work out pretty good. I've been over on www.steelsoldiers.com and looked around… lots of knowledgeable military vehicle experts there. I also have two surplus truck dealers in my area so I may drop by those joints in the coming weeks to see if I can gain a little more knowledge… God knows I need all I can get! I just remembered I have some used and abused hood bits from my 379 pete sitting outside my shop… maybe i could glue that stuff onto the front of the Fjord to make an F-350/379? Might fix any clearance issues. Last edited by Herk; 07-06-2014 at 09:39 AM. The 6BT is 36" from the front of the crank balancer to the back of the head/block (not including trans adapter). Guys are already cutting the firewall a bit for improved fit. The DT360 is a tad longer than the 6BT.. presumbly since it has wet liners. But DT466 is longer again because is has greater bore spacing. If you take a close look at the pix I posted you will see that this engine would be about 36" if measured from the crank pulley to the back of the block. The H2O pulley face is forward of the belts so I think this is close to 6BT territory. Now that I have more info it's time to take another ride…. Last edited by Herk; 07-06-2014 at 10:37 AM. Okay… just got back from looking at these engines. The first engine is a rebuild dated 2/88. Model # LDT-465-1C. Rods/mains turned 20/20. Comes with the complete clutch (1 3/8 X 10 spline input). It's used but very clean inside from just looking thru the oil fill cap and pulling the dipstick. I's a little weathered… light rust on the painted surfaces and the paint is also a little chalky. The water hoses will need to be replaced and it needs a little tidying up. Overall it's a 6 out of 10 on the exterior… a little paint and attention will go a long way. The second piece is very nice. Model # LDT-465-1D. 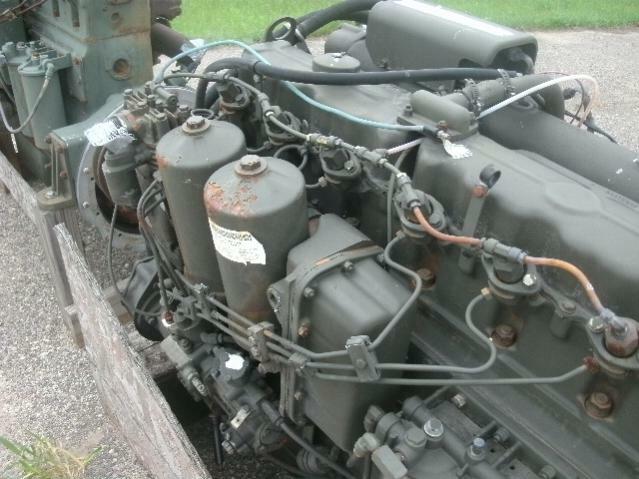 It's dated 5/88 and it's a nice, low mile original… not rebuilt. very clean… good paint. No weathering to speak of. Same clutch as #1. 8 out of 10. Both engines come with oil coolers and #3 SAE bellhousings (thanks u2slow). Length- front of crank hub to back of block 41"
Height-top of bellhousing to top of engine 15"
Width at widest point (turbo elbow to oil filters) 29"
Width @ bellhousing engine mounts 21"
I'm going to call the owner Monday and ask if I could see these things spin over… via the starter or breaker bar. If they turn I think they are going home with me. Last edited by Herk; 07-06-2014 at 04:09 PM. You commented about needing a vac supply for the truck's brakes. That really isn't an issue. There are several options. 1) Ford used a vac pump on some of it's diesel PU's. It would require a bracket. 2) Some of the Kubota swap guys are using an Izusu alternator that has a vac pump built onto the back of it. You need an alt anyway so it is handled in one bracket. 3) There are electric vac pumps in use also. 4) Swap to a hydroboost setup and the brake problem is solved but you will need vac for your HVAC controls probably. These have 24v starters. Are you going to run 2 12v alternators? These motors are much heavier and longer than the BBF gasser. Firewall surgury will be required. The trans that was behind these has no OD. Trans swaps would greatly increase the cost. Especially if using an Allison OD auto. These transmissions are also heavy and big. These motors are not big powerhouses, but plenty for a ton tow rig. Have your ridden in a Deuce and a Half? In cab noise is very high. You would eliminate the transfer case gear noise, but the rest is still there. Add more sound proofing to the firewall and floor. The benefit? They burn anything. Set up a good WVO/RUG system and your fuel cost go way down. These motors were used in 2050 Oliver tractors also. A local tractor puller, Shawn Peetz, pulls "Unfinished Business" in the ITPA 6000# super stock class. This tractor is using a modified LDT-465. Runs on methanol with a lot of boost. It is impressive. I couldn't find a video but Google it. Over 2000 hp for sure. Last edited by hunk-a-junk; 07-07-2014 at 08:27 AM. The alternator tip is appreciated… never saw one with a vac pump. I'll check that out. Otherwise a belt driven one will work. The Spicer used in the m35A2 has an O/D 5th gear but I want to use a smaller car/truck transmission (T-19, NP 833-O/D, Tremec/Ford toploader 4 speed O/D or similar). I can gain firewall clearance if I use a 4" body lift. When using a 6BT the body lift will allow you to pull the head without much difficulty… I think I can accomplish the same deal. But we won't know until the project starts. I could also use an electric fan eliminating the mechanical fan and allowing the engine to sit a few inches farther forward. I'm sure I can find a 12V starter that will work. Or have the original rewound to operate on 12V… but I' like to find a lighter weight starter. This is a 140 HP/325 TQ engine… I'm looking for good power and better than 10 MPG fuel economy… this should work. The Kubota alternator/vac pump is a slick deal…. it's on the list. I spoke to [email protected] Phoenix Castings and he can build an adaptor to mate the SAE bellhousing with a Ford manual transmission. That would allow me to use a Ranger Torque Splitter two speed in front of a Warner T-19 and have an 8 speed married gear box. Mate that to some 3.54 rear gears and I'd be golden… or I can use a straight T-19 and find a Brown-Lipe auxiliary box. Now I have to get my truck…. next week. Stay tuned.